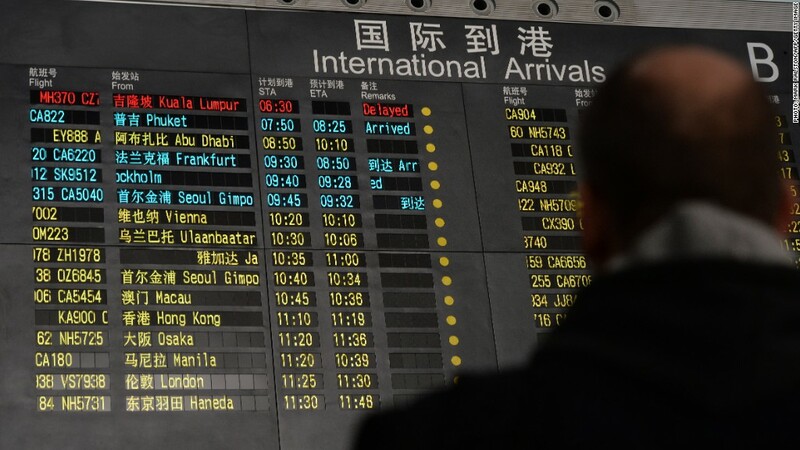 Malaysia Airlines Flight 370 from Kuala Lumpur to Beijing disappeared an hour after takeoff on Saturday. Shares of Malaysia Airlines were sharply lower Monday -- by as much as 20% -- after a passenger jet departing Kuala Lumpur went missing. Other Asian markets took a tumble on the back of weak economic data in the region. Stocks in mainland China fell on poor trade figures, while markets in Japan traded lower as the government said the economy expanded at a slower pace last quarter than initially reported. The missing plane, Malaysia Airlines Flight 370, disappeared an hour after takeoff Saturday morning en route to Beijing. At least two of the 227 passengers boarded with stolen passports, raising the possibility of terrorism. Search teams deployed by a number of countries have spotted oil slicks and some debris, suggesting the plane may have crashed, though this has yet to be confirmed. Stocks in Kuala Lumpur dropped 0.6% at market close. Airport operator Malaysia Airports also fell Monday, falling as much as 5% and pulling the market index lower. China said February exports fell by 18%, the worst contraction in years. Analysts were divided on whether or not the numbers were a red flag. Some attributed the decline to a seasonal weakness around the Lunar New Year holiday, while others said it was a sign the economic slowdown is accelerating. China, which also experienced its first corporate bond default on Friday, saw the Shenzhen Composite tumble 3.5%, the Shanghai Composite plunge 2.9% and Hong Kong's Hang Seng drop 1.8% at market close. Japan's Nikkei lost 1%, after the government revised annual gross domestic product growth to 0.7% in the fourth quarter, from 1.0%, ahead of a two-day central bank board meeting that begins Tuesday. Investors are also watching the uneasy standoff over Ukraine, which shows no sign of ending, adding to concerns that a growing conflict could damage the wider European economy.